The announcement comes on the heels of last Friday’s uber-successful launch of the Sprint EVO 4G, which shares many of the same features with the new iPhone. This puts consumers in an interesting spot – as the hardware and software offerings from both the Apple and Android camps begin to share more and more of the same features, it becomes increasingly difficult for a consumer with no allegiance to either side to choose the phone that best suits their needs. Shortly after Apple’s announcement, several other sites began running comparisons of the iPhone 4 to some of Androids stronger offerings such as the EVO 4G and Droid Incredible, but I haven’t been able to find a comprehensive comparison of the software features that each side has to offer. So, to fill that gap, we’ve decided to risk angering fanboys on both sides of the fence, and have put together a head-to-head comparison. 3rd Party App Multitasking N Y¹ Y Y ¹It's not quite 'true' multi-tasking as Android does it. Read here for more details. Now, obviously a 100% in-depth feature-by-feature comparison of all four operating system’s would be too massive a feat to undertake, so we chose some of the more buzzed about items while trying to remain fair to both platforms. In each case, the next generation operating systems offer many welcome changes, and are both a step in the right direction. 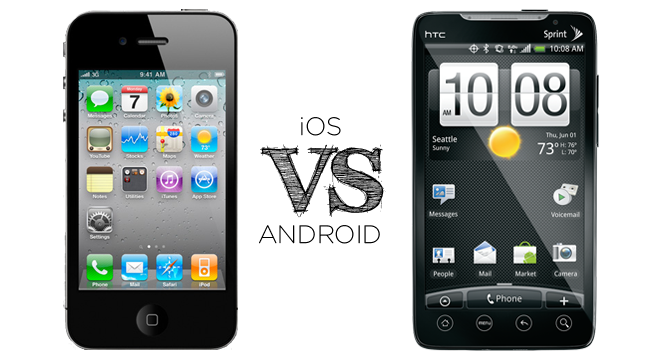 Now, the sticky part: being that we’re an Android-centric blog, there’s an obvious bias. However, I’d like to make it clear that we tried to pick the features used in the comparison as objectively as possible so as not to tip the scales in either direction. That said, looking solely at the numbers, it’s clear who the winner is: Froyo. At the end of the day, when you’re browsing the phone section of your local big box store and trying to decide between the two platforms, the biggest factor shouldn’t be which OS wins in a comparison chart, but rather which one offers the features that you require. Ultimately, if this chart helped you reach a decision, regardless of the platform, we’re happy. Let us know if you felt there were any features we left out, or if we might have missed something, or something needs correcting. We’ll be sure to keep the chart updated and as accurate as possible. Comments are open. Who wins?